Alfred R. Pursell of Tifton, Georgia and John W. Black of Hopkinsville, Kentucky conceived the idea for the Association of Veterinary Microbiologists in 1972. The concept was based upon an informal meeting of laboratory technicians and others interested in the laboratory diagnosis of animal diseases by virologic, bacteriologic, and serologic methods. The format for the meeting was to be a round table discussion on the problems and procedures of interest to the various areas. At the 1973 regional meeting of the American Association of Veterinary Laboratory Diagnosticians in Nashville, Tennessee, representatives of several diagnostic laboratories met with Purcell and Black to discuss the advantages of the proposed association. It was agreed that such an association would be beneficial to both the participants and their laboratories. 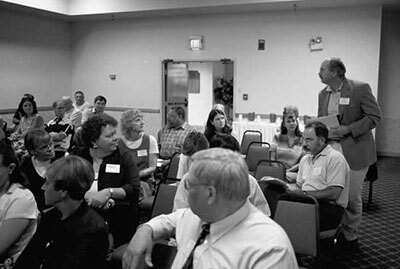 In 1975, with the encouragement of Dr. Wade Kadel, the director of the Hopkinsville laboratory, John Black sent notices to the microbiologists at each of the veterinary diagnostic laboratories in the southeastern United States, announcing a “Symposium on Techniques of Diagnostic Veterinary Microbiology.” The diagnostic laboratories of Tennessee, Kentucky, and Georgia sponsored this symposium. It was held at the Mountain View Hotel in Gatlinburg, Tennessee on May 22, 1976. A total of 33 people from eleven laboratories, representing eight states were present. John Black presided over the meeting and was elected the first president of the Association. Separate sessions on virology and bacteriology and a combine session of serology were held with a moderator selected to guide the discussion. An agenda served only as a guide and each participant was free to propose additional topics for discussion. The primary participants were the people actually doing the work on the bench. They were encouraged to present any problems and to work together on possible solutions. To establish the informality required for such an exchange, the use of titles was discouraged and everyone was on a first name basis. The objectives of the association, which were set forth in the constitution adopted in 1987 are "…to promote scientific investigations and their applications to the advancement of knowledge in this field, and to provide mutual assistance to participating laboratories in solving problems."